Re: Have you ever seen a UFO? He said: “According to the guy who filmed this, it had circled over his neighbourhood at least three times. “It looks like a perfect triangle. You cannot see anything except the lights. “I’ve tried to put on different light filters to get a clearer picture but all you see are the bright lights. “We are seeing a lot of these lately - especially in Ohio. Does anyone think they will "land" anytime in the next 500-1000 yrs? Guns kill people the same way pencils misspell wurds. Saw these guys in SoCal in the late 70's. In a little theater. I think it was in Long Beach. Best show ever. I can still hear it " Lights Out, lights out Diego"
bigjohn wrote: I am facilitated with astronomy. It’s not a stretch to think that out trillions and trillions solar systems, there are planets where similar conditions that allow life on earth exist. Maybe there are millions of “Earths” out there billions of light years away. Maybe some of those “Earths” developed millions of years before our Earth and their humans have an ability to use 100% of their brains. Following that train of thought, it’s not a stretch to allow a possibility that somewhere out there, a technological breakthrough that allows use of bent time and space had already been made (we already proved it’s possible using math). Maybe a technological breakthrough of exceeding the speed of light by a factor of a million had already been made. Our Earth might just be in the patch of space yet to be discovered by those by those scouting the cosmos billions of light years away. I love thinking like this. There could be some life out there that confirms to different requirements. Something that breathes nitrogen or eats carbon. 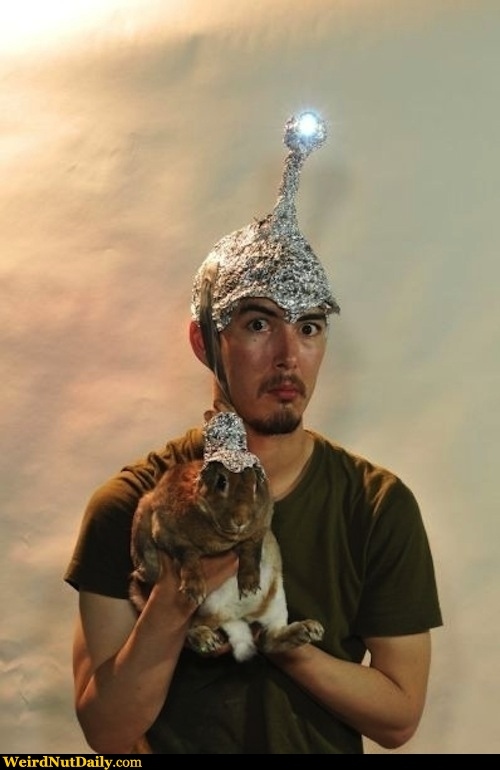 Its not that far fetched, now where did I put my foil hat! iron-pyrite wrote: now where did I put my foil hat! Is it still on your head? Here's my take on the UFO stuff. It's actually from a web site I frequent. But it accurately explains what I believe and teach. Not that anyone will necessarily care, but I figure another perspective might not be a bad thing. Question: "If aliens were proved to exist, how would that discovery impact the Christian faith?" Answer: We do not believe that aliens exist. The Bible gives us no reason to believe that there is life elsewhere in the universe; in fact, the Bible gives us several key reasons why there cannot be. However, that has not stopped theologians, astronomers, and science fiction fans and writers through the years from contemplating the “what ifs” long and hard. The debates have narrowed down where the problems would arise, if the existence and discovery of extraterrestrial life could be proved. Those who contemplate the existence of aliens and the impact their existence would have on the Christian faith commonly discuss the identity and work of Jesus. God sent His only begotten Son, God incarnate, to save mankind and redeem creation. Does that redemption include life on other planets? Or would God have manifested Himself on those other planets, as well (in the manner of Aslan in Narnia)? Does “only begotten” mean “only physical representation”? Or is it more limited, referring only to the human species? Another consideration: would an otherworldly, sentient, advanced life form sin and need redemption in the same way we do? Human life is in the blood (Leviticus 17:11). Where is the life of these hypothetical aliens? And what would have to be sacrificed to save them? Could the shedding of Jesus’ human blood save silicon-based glass creatures whose sin was melting and reforming themselves into unnatural shapes? Another topic of discussion concerning the existence of aliens and Christianity is what it means to be made in the “image of God.” Since God has no physical body, we take this to mean a reflection of God’s non-physical aspects—rationality, morality, and sociability. Would aliens, if they exist, embody the same characteristics? One issue rarely broached is the impact of young earth creationism on the discovery of alien life. It is conceivable, if highly unlikely, that the geological pyrotechnics that took place during the global flood could have spewed a bacteria- or lichen-tainted stone all the way to Mars where it found shelter in a misty canyon. But any life form more complicated or farther out would be much harder to harmonize with a literal reading of Genesis 1. Could demons have taken trees and shrubs and rodents and bugs to another planet with an environment similar to Earth’s? Possibly. But without the Spirit’s blessing of life, it’s unlikely any of it would have survived. Parallel creations? Maybe. The Bible does not mention them. Considering what we know about space and life and the world as the Bible portrays it, we already have an explanation for so-called alien activity on Earth. Reports of “close encounters” describe the ethereal, transient, deceptive, and malevolent. Accounts also record that encounters with supposed aliens can be stopped by a real, authentic call to Jesus. Everything points to the activity of demons, not extraterrestrials. In fact, it is plausible that the “powerful delusion” spoken of in 2 Thessalonians 2:11 will involve an alien-abduction theory to explain away the rapture. The “discovery” of alien life would have no effect on genuine Christianity. The Bible stands as written, no matter what secular theories are advanced or discoveries are claimed. The Bible says the earth and mankind are unique in God’s creation. God created the earth even before He created the sun, moon, or stars (Genesis 1). Yes, there are strange and inexplicable things that take place. There is no reason, though, to attribute these phenomena to aliens or UFOs. If there is a discernable cause to these events, it is spiritual or, more specifically, demonic in origin. In the final analysis, all conjecturing about what would happen to our faith if aliens were proved to be real falls under the category of “godless chatter” and “foolish and stupid arguments” that we are warned against (2 Timothy 2:16, 23). fredzoyt wrote: Here's my take on the UFO stuff. It's actually from a web site I frequent. But it accurately explains what I believe and teach. Not that anyone will necessarily care, but I figure another perspective might not be a bad thing. Ill have to disagree. Not everything can be put in the bible if it were no one could ever read it. There is nothing that says just because its not in the bible that it cant exist. Anything is possible. My goal with my website is not to prove or debunk anything its just to let people know what they have seen regardless of what it is. lucky43113 wrote: Ill have to disagree. Not everything can be put in the bible if it were no one could ever read it. There is nothing that says just because its not in the bible that it cant exist. Anything is possible. My goal with my website is not to prove or debunk anything its just to let people know what they have seen regardless of what it is. An astronomer at Columbia University has a new guess about how hypothetical alien civilizations might be invisibly navigating our galaxy: Firing lasers at binary black holes (twin black holes that orbit each other). The idea is a futuristic upgrade of a technique NASA has used for decades.